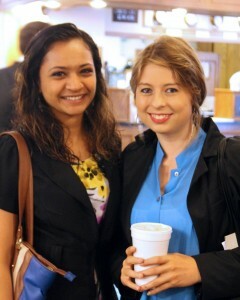 On May 9th, students from around the country met with the Secretary of Education, Arne Duncan. This is a collection of thoughts and reflections from the meeting, and a chance to begin taking collective action in the next few months. Find out how to get involved here! On the morning of May 9th, I had the privilege to meet with Secretary of Education, Arne Duncan as a part of a coalition of twenty students from schools across the country. Within that one conference room on the 7th floor of the Lyndon Johnson Department of Education headquarters, we collectively held over $600,000 in student loan debt. The night before the meeting, we prepared ourselves to retain control of the meeting and for the difficult questions. I wrote my statement on paper five times – representing more than 20 million students with federal loans to the most powerful educational administrator in the country leaves no room for mistakes. I went to sleep that night feeling empowered yet anxious, ready to face the challenges of the next morning. We presented three demands to the Office of Secretary to address the student loan crisis. We demanded first that the Department cut their contract with Sallie Mae that incentivizes Sallie Mae to lure students into default to earn commissions. This demand was followed by a charge to reform the criteria for the loan allocation process from the Department of Education to private corporations, taking into account the number of complaints from the Consumer Financial Protection Bureau and the level of development in educational affordability programs. Out of the 3,700 public comments submitted to the Consumer Financial Protection Bureau, nearly half of them implicated Sallie Mae. Secondly, we pushed Secretary Duncan to publicly call for a meeting between the CEO of Sallie Mae – Albert Lord – and the students working on this campaign. Our final demand was to clarify the relationship between the Department of Education and Building Hope, a foundation funding the charter school movement. 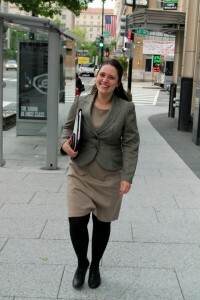 Cesar Chavez D.C. Public Charter School, chaired by Albert Lord and a recipient of funding from Building Hope, was forced to settle in court with a teacher who was illegally fired for trying to unionize. Secretary Duncan was visibly disheveled upon receiving this information, and made it clear that the Department of Education would not support projects engaging in illegal activity. The meeting was a step towards returning to educational affordability and access lauded in the Department of Education’s mission statement. Secretary Duncan responded positively yet cautiously, and told us to hold him accountable to following up with us. We hope that Secretary Duncan will recognize that he has the power to change the trajectory of student debt in this country, and to remember that there are millions of students feeling the crunch of debt, default, and distress. If he doesn’t use his power, he can bet that we will continue to use ours. Only a few hours after arriving in Washington, D.C., I sat with about 20 fellow organizers at a Thai restaurant. Engaging conversation spread over 2 long tables and the only reminder of the pressing issue that had brought students from 11 states together was a napkin being passed around to each person. One by one we wrote our initials and a dollar amount. The light hearted mood was interrupted once the napkin had made its way around and the figure totaled. $602,000. The announcement of our group’s collective student debt infected the room with sober reality. Our group had gathered in Washington, D.C. to meet with the Secretary of Education, Arne Duncan, to ask him to cut the Department of Education’s contract with Sallie Mae as a step in unweaving the corporate knots he has tangled our higher education system into. It was time he answers to those of us who shoulder the debt that is a direct result of his decisions, while serving as Secretary of Education in the Obama administration. When we introduced ourselves in the meeting we announced our debt along with our names. The figures on the napkin came to life as each of us claimed those numbers out loud, and as many of us shared the personal narrative behind the red ink that stains our future; evidence of a failed higher education system. When I said my number I saw Secretary Duncan’s eyebrows rise. I had been reciting my number several times the night before in preparation for this meeting. I had frantically cried my number to my mother every time a new semester started and a new loan had to be taken out. The number I had placed on the napkin, the number I included in my introduction, had become so ingrained in my daily stress, that I had forgotten the shocking effect it could have, even on the Secretary of Education. I began my undergraduate degree the same year Secretary Duncan took office. In his 5 year tenure student debt has surpassed one trillion dollars without any serious change in policy to help students avoid taking out unmanageable loans in pursuit of an education. Also in that time, Duncan has continued to privatize the federal loan process and now the Department of Education spends over $1 billion dollars a year contracting private companies to service federal loans. The largest contract is with Sallie Mae. Instead of using funds to help students succeed, Secretary Duncan chooses to pay high profits to those aggressively and unethically, collecting on the debts that are destroying students’ futures. In those same 5 years, while pursuing an undergraduate degree and now a law degree, I have become buried under $145,000 of student debt. Our meeting with Secretary Duncan included several successes. We brought the concern that the current criteria used to evaluate servicing companies rewards the companies for pushing students into default and does not encourage them to enroll qualifying students into programs such as the Income Based Repayment Plan. As a result of financially incentivizing Sallie Mae for collecting on students in default, the company works towards student failure, instead of helping students succeed in paying off their debt. Secretary Duncan welcomed the feedback on the criteria and agreed to consult with us in determining the criteria used to evaluate future contracts. He requested that we communicate further with him on specific suggestions for revisions of the criteria. Additionally, we demanded that the Department of Education institute a policy that stops funding organizations that have violated the law. We particularly mentioned the Cesar Chavez DC Public Charter school, of which Sallie Mae CEO Albert Lord sits on the board. The Cesar Chaves School has recently violated the collective bargaining rights of workers when it illegally fired teachers who were trying to unionize. Secretary Duncan showed great concern and stated that he didn’t want the Department of Education funding projects that violated the law. Our main and clearest demand still goes unmet. Duncan would not yet agree to cut the contract between the Department of Education and Sallie Mae. While he did agree to encourage Albert Lord to meet with us and he encouraged us to go to the shareholder meeting, this is not enough. Secretary Duncan heard through testimony at the meeting how Albert Lord treats students who come to Sallie Mae. Past actions have included riot police and K9 units. Instead of speaking with students, Albert Lord has sent the police after them and had them arrested. I will be at that shareholder meeting and so will most of the students who spoke with Secretary Duncan. On May 30th, we will stand alongside hundreds of other student who are dedicated to fighting for our right to higher education even in the face of getting arrested and large amounts of security wielding batons and shields. The pressing question is: how many students will have to be pulled off in handcuffs before Secretary Duncan will be ready to stand up for students and cut the contract with Sallie Mae? I was nervous as we churned single file through the atrium metal detector at the Department of Education. My experience with meetings of this nature has been limited almost exclusively to meetings with University administrators or state-level representatives. Many of these have been tense, sometimes quietly hostile, experiences, so I was worried that this morning’s meeting would be similar in tone. Nonetheless we had spent hours preparing and had a clear sense of our goals and directives. Moreover, we represented years of organizing and activism surrounding the issue of student loan debt, as well as our collective personal experiences as students who have our own student loans, some of of them through Sallie Mae and other private lenders. I am the oldest daughter of two public educators; my mom was a public school teacher and my father was a professor at a public university. Needless to say, I was raised in a space where the power of education and being an educator were both important values. My mother, in particular, was viewed as a pillar in my small Oklahoma community. It was difficult to go anywhere in town without running into a former student who would inform me that she was “the best teacher he/she ever had” or that she “had changed his/her life.” At the end of her career she was nominated for an Oklahoma All-State teaching award. However that same year she felt pressure to retire—cuts to pensions and caps to pay increase for public teachers with her credentials and years of experience had left her feeling unappreciated and with limited choices. At this same time I became involved in teachers unions on campus at the University of Illinois, Urbana-Champaign and began to see the power in organizing and unionization that my mom had little access to in a right to work state. The coupling of these two experiences heightened my concern upon hearing that the Department of Education potentially held ties to Building Hope. The Building Hope affiliate Caesar Chavez Public Charter school in Washington D.C., which has received support from Sallie Mae and includes Albert Lord as a board member, illegally fired one of its teachers for trying to organize. In our meeting I asked that Secretary Duncan to clarify the relationship between the Department of Education and Building Hope. Building Hope does not represent the values of public education that I was raised with and I have committed my life to fighting for. Nor do I assume that this lack of character is something the Department would be comfortable affiliating with. Despite my preconceived misgivings, the meeting went surprising well. Secretary Duncan seemed receptive to our concerns and interested in both our stories and our trio of demands. While I think this was due, in some part, to his awareness that the student loan debt crisis is something that the Department of Education has to address, I also think the strength and power of our personal stories were so compelling that he had little choice but to do so. There were very few moments where we receive a concrete “yes” to a particular demand, but comments from Secretary Duncan and his staff made it quite clear what we would need to do in order to move forward. Duncan assured us that “we want to do the right thing here” and that “we take this really seriously” during the meeting. If these are genuine sentiments at the Department of Education, then I think that there is real possibility in we can gain ground in achieving our stated demands for the meeting. If we continue to remind the Secretary, the Department of Education, and Sallie Mae that student activists are not going away and will continue to fight for student loan fairness and accessible higher education, then I feel confident we will be able to make some significant movement. The Sum of Our Parts? A Movement. I had the opportunity to go with students from around the country in meeting with Education Secretary Arne Duncan on May 9th. I always try to go into those kinds of meetings, ones with people in a significant position of power, with the mindset that they are equal to us because ultimately, they are. Being a Secretary of Education makes one no more moral, no more intelligent, no better than any of the millions upon millions of students out there. The meeting reflected that. We were well prepared, well read, and well organized. We came in with three simple demands: cut the $100+ million contract with student loan profiteer Sallie Mae as well as change the criteria for how loan servicers receive contracts, publicly call on Sallie Mae CEO Albert Lord to meet with us as students, and finally to cut the Department’s ties with Sallie Mae and Walmart-backed Building Hope Charter Schools and to ensure that they cut any contracts with vendors that break the law as Building Hope did. We received some very encouraging signs. Though he will not make a public statement calling for a meeting between Albert Lord and us he will “encourage” such a discussion to take place. Though he will not cut the contract at this time with Sallie Mae, we will be talking to his department about putting in criteria for loan servicers that encourage them to move students into programs like Income Based Repayments and not into default. Finally his view on Building Hope was that “they don’t want to give money to people who break the law.” The last little bit of encouragement that happened to slip out at the meeting was that he told us to keep doing what we were doing. He told us we should keep trying to get a meeting with Sallie Mae, and that we should be going to their shareholder meeting on May 30th in Newark, Delaware. We have a long way to go obviously. 37 million people with over $1 Trillion of debt won’t fix itself overnight. However this shows that we are making an impact. We are shaking up the status quo into the highest levels of the corporate and government world. When I first started working with the student debt campaign in October of 2011, I would never have imagined that we would have been able to move things this quickly. We are not just building a corporate campaign, we are building a kind of movement that says we should not be punished or pigeonholed for trying to better our community and ourselves. I am a student at the public university with the highest student debt in Missouri: $27, 300. Students in my university and across the state are hurting because of the massive student debt they accrue in order to get a education. We are not the only ones. Student debt across the country has reached one trillion dollars during the Obama Administration under the watch of Secretary of Education Arne Duncan. That is not acceptable. Students from across the country met with Duncan to hold him accountable for making education affordable for our students. Specifically, our first demand was to to sever the student loan contract with Sallie Mae. If not met, we wanted additional quality indicators to the scorecard that the Department uses to evaluate contracts with existing debt holders, indicators like the number of graduates enrolled in positive programs like income based repayment plans and pay as you earn. We asserted the need for Secretary Duncan to publicly call for Albert Lord, the CEO of Sallie Mae, to meet with us. Lastly we wanted clarity of the Department’s relationship with Building Hope, an umbrella organization that gives grants to charter schools, including D.C. Charter Cesar Chavez (of which Albert Lord is a board member) for illegally firing a teacher for organizing in her workplace. Furthermore, we wanted a commitment to create a policy that would sever ties with any organization that breaks the law at any time. These were our important demands to concretely benefit students who are suffering from the pervasive practices of Sallie Mae at every level. Upon beginning the meeting, we entered with feelings of anxiety, preparation, exhaustion, and excitement — and a late meeting time, and absence of Under Secretary Martha Kanter. This attempt at derailing was quickly overcome by a strong introduction of our personal and collective debt as a cohesive group of eleven of us introduced ourselves and our three demands: to cut service contracts with Sallie Mae, issue a public statement for a meeting between Albert Lord and senior executives of Sallie Mae and students, and finally instituting a policy that prevents organizations that break laws from receiving the Department’s funding, specifically the case of Building Hope (a charter school in DC that has Albert Lord on their board, and illegally fired a teacher for supporting unionizing). Although somewhat hesitant to speak in a classic long board meeting room with suited professionals in an important U.S. Department, the general atmosphere of the meeting quickly changed from a cold bureaucratic mood to a comfortable rehearsal of our expertise on issues we have worked on all year, and personally impact us. I felt increased empowerment as testimonies began to heat up, and Secretary Duncan began to call on us for provisions to their updated lender contracts, statistics on Sallie Mae, and legal questions about the Building Hope scandal and treatment of USSA students who attempted to get a meeting with Sallie Mae and were arrested. This feeling of reliability on us reiterated our position of power as student leaders, organizers, and experts on this issue who will adamantly continue to battle against unfair loans and educational policy. I grew up with a single mother who did not have the opportunity to attain a four-year college degree, and in turn fell into a life of poverty and dependence on welfare in the post-industrial city of Buffalo, NY. Because of her unstable way of life, her ability to parent was sacrificed. Fortunately, my extended family was available to rely on as roll models and support. Because of this, when I was nine years old I testified in court to live under the guardianship of my grandparents. My grandfather similarly grew up in poverty, yet was able to capitalize on the GI bill, which provided him with an affordable education and opportunity to become a successful architect. Following in his footsteps of using academia to achieve a upper-middle class lifestyle, I chose to attend one of the nation’s top universities to get my degree and attain a similar economic status. His vision for me was to reach and surpass his educational status. When he passed away suddenly from cancer the spring before my attendance to University of Wisconsin Madison, his drafted Will designated funds for me to achieve his vision. Unfortunately, that will was contested and finalized to exclude me. Although I was provided with scholarships, federal grants, and loans, I still will graduate with $16,000 in debt upon my undergraduate graduation without financial support from my family. This challenge to repay undergraduate debt as well as the need to additionally earn a masters degree to succeed as a middle class citizen in this job market is a huge risk for me to take on. My narrative became most disheartening when I realized that this situation is not uncommon amongst my peers. Many families’ savings for their kids’ education have been redistributed due to lost funds in the recession, similarly contested Wills from grandparents, and the challenge to qualify for aid. It makes me furious to know that the Department of Education, whose mission is “to promote student achievement and preparation for global competitiveness” is completely discredited by its service contract with Sallie Mae, a private lender who has profited off of our student debt defaults. This bet against students’ success is not the mission of the Department of Education, and needs to be changed. Stop Pushing Us Into Debt! Eleven students told their stories and conveyed an urgent message about student debt crisis, driven by Sallie Mae, with Secretary Arne Duncan and other Department of Education officials. We were there to end the public crisis of student debt, but shared our own individual stories to highlight what had brought us to this point. The Great Recession shook my family’s faith in the American Dream. Both of my parents work at GE Healthcare, and a third of their departments were being laid off in the winter of 2008-2009. Without confidence in their job security, my parents were coming home stressed. In September 2008, my parents, who invested their 401(k) funds in their company, saw their retirement fund drop as General Electric stock dropped from $35 per share to $7 per share. I’ve never seen my parents, who had been sent to hard labor camps in China and had immigrated to the U.S. with $200, so scared in my life. I was a high achieving high school student. Four years ago, I was thrilled when I gained admission to an Ivy League school. But when I saw my financial aid package, no one in my family was thrilled, especially during the depths of the recession in the early spring of 2009. As a 17-year-old high school student, I was terrified of taking out a five-figure debt load every year in a then terrible job market. After receiving a merit-based scholarship that incentivizes valedictorians and salutatorians to attend public universities in Wisconsin, I made a conscious decision to attend the University of Wisconsin-Madison, a school that I love and has shaped my worldview. As a result of my decision four years ago, I will graduate debt free from UW-Madison in two weeks with a bachelor’s of science in biochemistry and history. In the meeting, Duncan agreed to encouraged Sallie Mae’s senior executives to meet with students and was receptive to changing the criteria in the Department’s future servicing contract with Sallie Mae. We urged Secretary Duncan to promote new programs such as income-based repayment and Pay As You Earn as important metrics in determining Department contracts with loan services. If the Department continues to claim their pride in these reforms, they should act to prioritize them in their largest contracts. Students will hold Secretary Duncan accountable to improve the criteria that determine loan servicing for millions of students. On the morning of May 9, 2013, students affiliated with the United States Students Association, Jobs with Justice, Student Labor Action Project, and the American Federation of Teachers met with the Secretary of Education, Arne Duncan. This meeting was set up after more than 150 students and community members held a sit-in in front of the U.S. Department of Education building on March 15th. At the meeting, students including myself demanded three things of Secretary Duncan. First, that Duncan cut federal servicing contract with Sallie Mae. If this demand was not met, we requested that the Department alter the criteria upon which servicers were chosen for loans. Second, a public request to Albert Lord (CEO of Sallie Mae) and other Sallie Mae executives to meet with us. Our final demand was for the Department to institute a policy that rescinds Department grants and funding from bad acting organizations, such as Building Hope. Nerves were on high, but we all quickly came together and made the best of the meeting that we could. And, I really do believe that it paid off. Secretary Duncan was quite receptive to our concerns. While we did not start off with a concrete ‘yes’ to cutting the contract, but we did get an enthusiastic response to changing the criteria for the new contracts that are set to come out in June 2014. Then, he said that he could not publically demand that Albert Lord meet with us, but he would publically encourage him to. He also told us that we were doing “all the right things” and to keep going to Sallie Mae shareholder meetings in efforts to meet with Lord and other senior executives. Throughout the meeting, the Secretary would remind us that the Department “[wants] to do the right thing here” and to that we should “hold [Secretary Duncan] accountable.” I want to believe that these were genuine sentiments and that the Secretary and the Department as a whole are in support of our efforts. These sentiments show me that they are aware that we are determined to make this student debt crisis better for everyone, and that we are not going to stop until private companies like Sallie Mae is brought to justice for their predatory practices. Victories in Washington tend to arrive piecemeal. 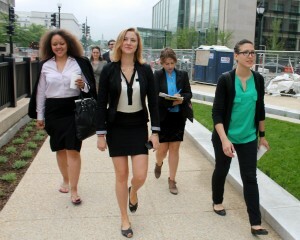 Today, was a victory for the United States Students Association, Jobs with Justice, and select national student representatives who met with US Department of Education Secretary, Arne Duncan to demand student debt reform, particularly regarding the banking giant Sallie Mae, who continues to service and control the more than 4.3 million student loans for the Department of Education. The demands: 1. Cut contracts with Sallie Mae or change the criteria for Department servicers so that they are not rewarded when students default; 2. Publicly call on Sallie Mae CEO Albert Lord to met with students; 3. End Department contracts to companies that break the law, namely the Building Hope Charter Schools, a board upon which Albert Lord sits, which fired teachers for trying to unionize. I was surprised that Secretary Duncan was so engaged with us. Initially, it seemed like they were pushing a hard stance at us, citing their criteria metrics as the solution to our problem, which was among the issues we wanted address. Secretary Duncan tried to derail us, demanding to know why we were after Sallie Mae and claiming that he has too many vendors to single one out. To which one of our facilitators, Ben Bull, replied that Sallie Mae is the standard. After that, I told my personal story about my blue collar grandmother and her belief that college was a waste of money and I’d be better off getting a Federal job. I saw a reaction from Department of Education staffers, Bill Leaf and Jeff Baker. I thought the other points they reacted to in my speech was that I fought hard to have a financial relationship strictly with the Department, and that handed that sacred relationship over to Sallie Mae without my consent. Secretary Duncan looked a little guilty and they all looked uncomfortable. Eventually, they relented slightly on criteria, offering to allow us to submit proposals. I thought the bigger successes were in their admissions. First that we were doing the right thing “by going to the Sallie Mae shareholder meetings and to keep doing it up.” Also, Secretary Duncan said that the Department does not want to support an organization “that breaks the law.” He asked us to follow up with the attorney general to investigate. I think we can use this meeting to gain further momentum in challenging the involvement of a predatory company like Sallie Mae to mange student’s economic freedom. 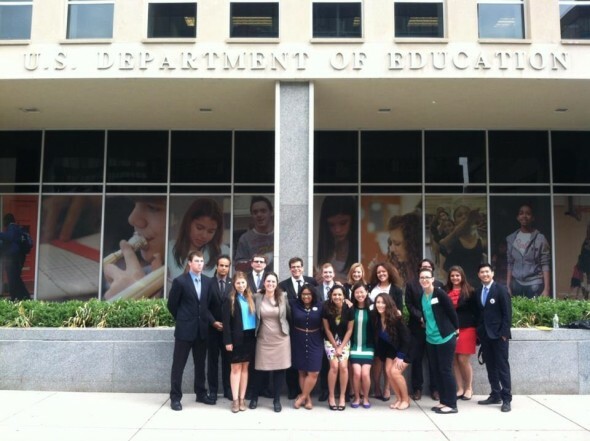 On May 9th, 11 students from across the country met with Secretary of Education Arne Duncan and members of his staff. The students, affiliated with the United States Student Association, the Student Labor Action Project, Jobs with Justice, and many local organizations, came with three asks. The first was for the Department of Education to cut its contract with Sallie Mae, the largest private profiteer of student debt in the country. The second was for Secretary Duncan to call on Sallie Mae CEO Albert Lord to meet with members of the United States Student Association, Student Labor Action Project and Jobs with Justice. The third was for the DOE to clarify their relationship with Building Hope and the Cesar Chavez D.C. Public Charter school, where a teacher was fired for attempting to unionize their colleagues. The students who came to D.C. to meet with Secretary Duncan arrived a day early in order to prepare for the meeting. This was really important in terms of our ability to take control of the space once we entered the Department of Education building. We had spent a bulk of the previous night rehearsing, honing our talking points and preparing for any possible outcome of the meeting. Secretary Duncan arrived about 13 minutes late to the meeting, which is a tactic I have seen administrators at my school use in order to minimize the amount of time spent listening to student concerns. Based off of my past experiences, I was pleasantly surprised when we still ended up with the originally agreed upon time with the Secretary. The meeting began promptly once Duncan entered the room under the facilitation of two students, Ben Bull, a member of the USSA Board of Directors, and Beth Huang, the Vice President of United Council of Wisconsin Students. Inside the meeting, my fellow students stood firm to our demands, and the Secretary and his staff were surprisingly receptive. When asked to cut the Sallie Mae contract, Secretary Duncan responded: “We can’t do that tomorrow”, but encouraged us to keep pushing before the contract expires June 2014. Additionally, Secretary Duncan did agree to taking suggestions from the USSA, and SLAP students in formulating its new contracts with service providers. Among the changes we would like to see to these contracts are provisions which incentivize loan processors to enroll students in programs like Pay as You Earn and Income Based Repayment programs. This entry was posted on Friday, May 10th, 2013 at 5:02 pm. It is filed under Blog. You can follow any responses to this entry through the RSS 2.0 feed. I have to say that for the last few of hours i have been hooked by the impressive articles on this website. Keep up the wonderful work.